SANTA’S IN THE SHARK TANK AT BLUE PLANET AQUARIUM! Visitors to Blue Planet Aquarium, can enjoy underwater encounters with a scuba-diving Santa Claus over the festive period. The fearless Father Christmas is braving shark-infested waters to deliver presents to the aquarium’s team of divers and also hand out some treats to the fishy residents. The sub-aquatic Saint Nick is sharing the 3.8 million litre display with three-metre-long sand tiger sharks, lemon sharks, giant stingrays and more than 700 other tropical fish. Blue Planet Aquarium’s Phil Jones said: “Our shark diving talks and feeding displays in the giant ocean display are always one of the most popular parts of the visit for many people. “We’re hoping our sub-aquatic Santa will add a festive twist to the experience and will prove to youngsters there really isn’t anywhere Father Christmas can’t deliver presents! “One of the unexpected bonuses is that the sharks and other fish are extremely curious and tend to follow him around the display which makes for some spectacularly close encounters for Santa,” he added. 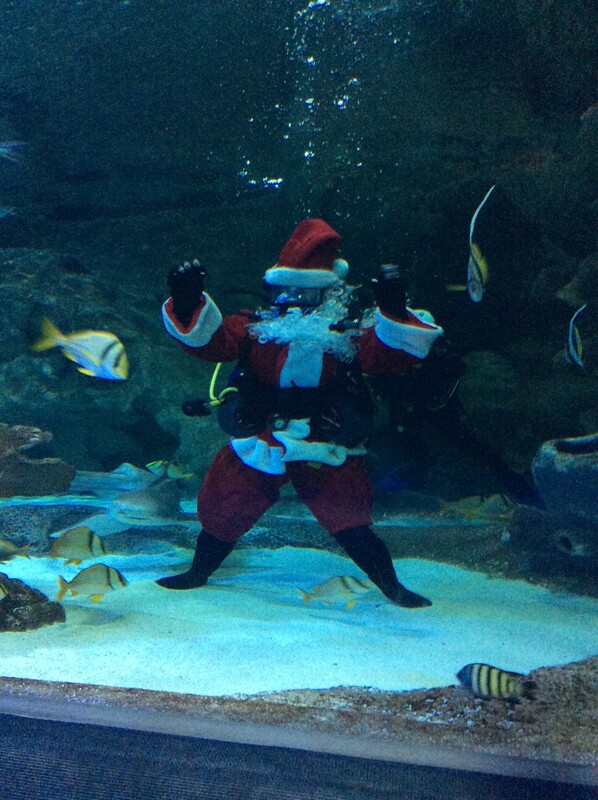 Diving Santa will be taking the plunge daily during the aquarium’s regular dive shows and from December 21st – 24th. The aquarium is also offering special prices over the festive period for its Shark Encounter and Junior Shark Encounter dives with limited places available online for adults and for children aged 8-15 years. Blue Planet Aquarium, Cheshire Oaks. To find out more about Diving Santa and all the other Christmas activities at Blue Planet visit www.blueplanetaquarium.com or call 0151 357 8804.